Marlboro Red Cigarettes made under authority of Philip Morris Products SA. 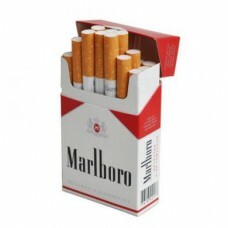 Marlboro Red can be proudly said to be the most popular brand in all countries among all folks. It deserves special appraisal by thankful Marlboro smokers. Did you know that theses cigarettes received name after Great Marlborough Street, where the original Red Marlboro plant was located? London has always been a place of utmost fashion and pretentious tastes. Probably that is why we, on some levels of our consciousness we, when smoking Marlboro red cigarettes feel like a vogue smokers. Or it is all due to the fertile and rich Virginia land where the Marlboro Red manufacture is located now. These are true American cigarettes that conquered the world by its quality and affordable price. Best brand ever smoked, but of course there always will be people who like other brands or can not afford themselves this tobacco miracle. Ever now and again you deserve Marlboro red, do treat yourself and buy a box of Marlboro reds.